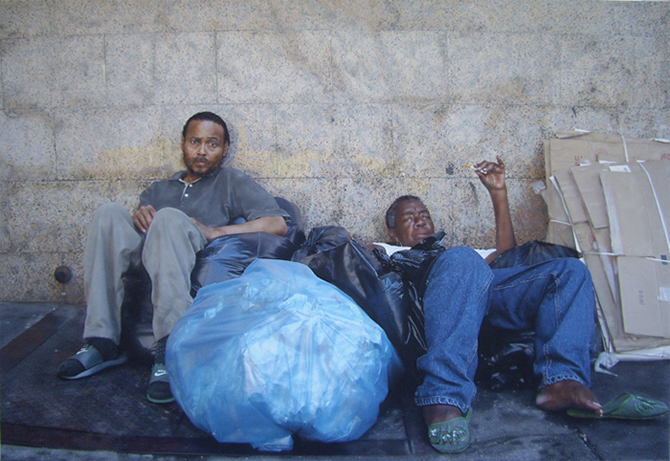 Their possessions were plastic bag contents and cardboard beds on the cold hard sidewalks. We talked about how they ended up on the streets and what their hopes and dreams were. Dolores asked what I would do with the photos. I told her I would be having a show in the city and that they were welcome to the opening as my personal guests. Dolores said "Hey Neil, did you hear that? Denis here says we're invited to his painting show. We can go get some new clothes and I'll wear a pretty dress. Yes, we'd love to come."